Dominic Ball in action at Swindon on his Posh debut. Photo: Joe Dent/theposh.com. Debutant Dominic Ball was thrilled with his winning start in a Peterborough United shirt. 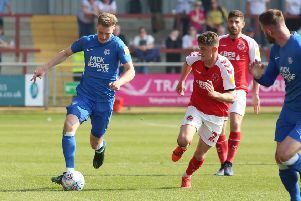 The 21 year-old centre-back, who is on loan for the rest of the season from Championship side Rotherham United, starred as Posh won 1-0 at Swindon to move up to eighth in the League One table. Michael Bostwick's performance impressed new signing Dominic Ball. Photo: Joe Dent/theposh.com. A win at Oldham on Tuesday (January 24) would move Posh to within a point of the play-off places. A point would also lift them into seventh place. “I felt Swindon were a very good side,” Ball stated. “They pass the ball really well, but we kept them at bay and then played to our own strengths so it was a very good win. “I’ve come here to play games and to win games so three points and a clean sheet is the perfect start for me, but this was a strong team effort. “The clean sheet was not just down to the back four. Players like ‘Bozzy’ (Michael Bostwick) and ‘Fozzy’ (Chris Forrester) worked hard in front of us. “I have a good feeling about this team. The atmosphere in training has been really good and that’s always important if you want success. “I can tell from training that we have a lot of quality in the squad and now we need a repeat at Oldham in the next game. “It was a good comeback from a very disappointing defeat the week before (Posh lost 5-1 at Bury), but the manager insisted that was a one-off result and anyway he’s forever telling us not to get too high or too low. “We’ll bank this win happily, but it’s just another three points in the grand scheme of things. We have to go to Oldham and deliver another performance. Ball would have made his debut at Bury, but for a shoulder injury.